Enjoy the world of benefits in 10 resorts! 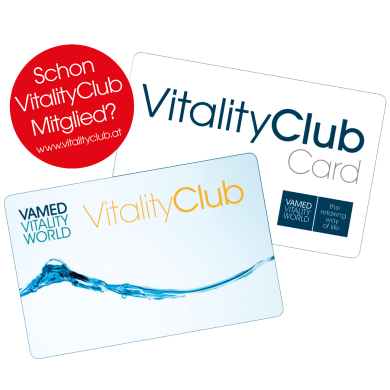 The VitalityClub is a bonus club created by the VAMED Vitality World. Every time you stay at the hotel or visit the SPA you can collect valuable bonus points in all our 10 resorts, which are credited to your account once a month and can be converted into vouchers for a number of services in our spa and health resorts. Plus, there are lots more beneftis available at 3 bonus levels - CLASSIC, SILVER & GOLD. Collect valuable points with every SPA and Hotel visit. These points will be credited to your account the following month. Convert your points into attractive vouchers - for massages, SPA entrances, overnight stays and many more. 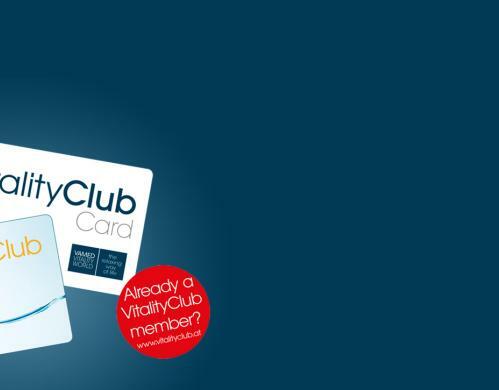 Register a partner card at the VitalityClub portal. This gives the possibility to collect points with two cards on one joint account. Resort: You can easily register for the club in via tablet, as well as at the terminal. Should you not be receiving exclusive offers via E-Mail you can subscribe for the VitalityClub newsletter in the VitalityClub portal. Furthermore, you will find the general terms and conditions. For more information on the VitalityClub please click the following link.